Prevention is of utmost importance to this practice. We believe keeping your own teeth healthy is the top priority. Finding decay early can often eliminate the need for extensive dental work. Our practice has highly educated dental hygienists that provide thorough cleanings, sealants, oral cancer screenings, and periodontal therapy when needed. We utilize the best dental materials and equipment available today, including a dental xray system that has the lowest amount of radiation exposure on the market. If a cavity is discovered, we can very conservatively repair the tooth with a tooth colored composite filling, usually eliminating the need for a crown. If a crown is required to protect the tooth, our office utilizes the most researched and reliable materials to achieve not only a very strong crown, but a crown that has superior aesthetics as well. Bridges can be fabricated to replace missing teeth when a dental implant is not an option. If you are missing one tooth or more, dental implants may be your best option. We are able to restore your smile to full function without having to have a removable denture or prosthesis. The implant replaces your entire tooth, including the root and the crown, without having to touch the adjacent teeth. Often implants are used in conjunction with dentures to achieve maximum support and stability, often eliminating the need of using adhesives. 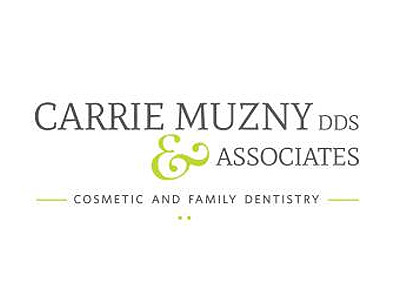 Dr. Muzny has completed extensive post-doctoral training in veneers and smile design. We emphasize a very personal approach to smile makeovers, understanding the importance of having each smile unique, and not a cookie-cutter design. We work with the top dental laboratories in the country, and our highly skilled lab technicians often come to our office to meet with the patient and help design the smile of their dreams. The helps ensure that you are getting the smile that is perfect for YOU. We offer Zoom II whitening, and in-office whitening system that can dramatically whiten the shades of your teeth with just one visit with their innovative teeth whitening system. Zoom II offers the best cosmetic teeth whitening system available today. Custom bleaching trays are also fabricated for take-home bleaching options, as well as very convenient bleaching strips if you choose.